Welcome to Catch a Canoe & Bicycles Too! 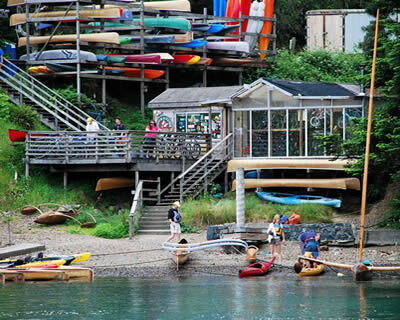 Nestled in a small cove on Big River Estuary, just before it flows into Mendocino Bay, is the adventure destination for outdoor enthusiasts. Established in 1982, Catch a Canoe and Bicycles Too offers ultra stable redwood outriggers, kayaks, canoe, SUP and bicycle rentals to both inn guests and for anyone who wants to explore beautiful Big River and beyond. We cater to families, pets and their owners, singles, couples and groups. We offer tours and maps and insight into the history and geography of Big River and the Mendocino region. Video created by Wire Walker Studios. Big River Estuary, the second longest in California, remains undeveloped throughout it’s 8.3 mile length. In 2002, the adjacent lands were purchased through a massive local fund raising effort and are now a part of the Mendocino Headlands State Park. A gentle rolling bike trail follows Big River as it meanders eastward into a secluded redwood canyon where several trails interconnect. Big River is a tidal estuary and a gentle class 1 waterway. Harbor seals, playful river otters and a variety of birds can be seen on your journey. Paddle a single or double kayak, or perhaps try a stand up paddle-board. Guided Tours aboard the 9 person Solar Wind Tribrid are offered daily during the summer months and feature wind and solar electric power for effortless cruising. 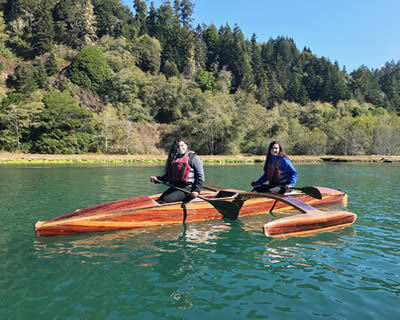 The stars of the show at the Stanford Inn’s Catch a Canoe & Bicycles Too are the locally handcrafted redwood outrigger canoes. Ultra stable, yet narrow and efficient, each one has an intuitive foot controlled rudder for ease of steering. Designed in house, and constructed by local artisan Bob Cummings from re-purposed redwood barns, these unique boats are only available here in Mendocino. Several configurations are available which can accommodate families and friends from 2 to 7 persons. The pet friendly Canine series are the only canoes worldwide that are designed for both humans and dogs. 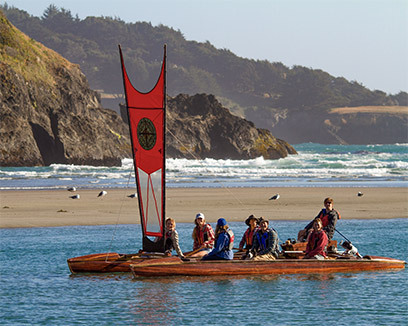 Gliding silently along Big River Canyon in a beautiful redwood outrigger is one of life’s simplest pleasures, and can be the highlight of your vacation in Mendocino.